The next STERN pinball machine is TRON! There is a new update over at PinGame Journal about the next Stern machine, which is TRON. It looks pretty cool - three flippers, plenty of ramps. It's from the same team that made Iron Man and Avatar. Plus it's got the Daft Punk music from the soundtrack. I look forward to seeing this thing on location! I have yet to play their new Rolling Stones game yet. Anyone played that yet? This afternoon Jon and I headed over to the old telegraph building to play some pinball. We started a two-player game of Medieval Madness and neither of us was doing very well. After both of our second balls, we each had less than 1 million points. Then, somehow on my third ball, I took the game from the worst start possible all the way up to the end of the game. I lit all six of the blue badges, entered Battle for the Kingdom, and was three center shots away from beating the game when I tilted (the damn ball got stuck behind that right troll with 4 seconds on the clock! I lost a 25x bonus - whoops). I ended up with 163 Million Points and a new Troll Record (60!?!) It was a hell of a game. One of the best I've ever played. And how many times have you had a crappy ball one and ball two and just given up on your game? Well, I'm here to tell you this: Never give up! You can always turn that game around. Even if you just have one ball left. As long as there's a ball on the playfield, you're still playing pinball. Keep it going! 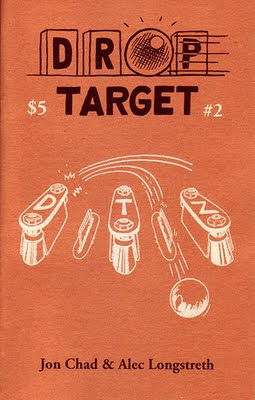 Drop Target #2 is now available for ordering! 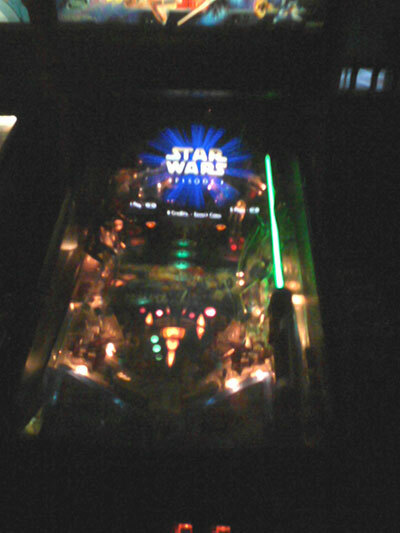 I just returned from a week in Portland, Oregon where I played A LOT of pinball. Ground Kontrol was getting set up for the PDX Pinbrawl which was on Sunday. They had set aside certain machines so that tournament players could get warmed up and get to know the machines. Sadly, I missed all of these festivities because I was stuck at the Stumptown Comics festival all weekend. Oh well! 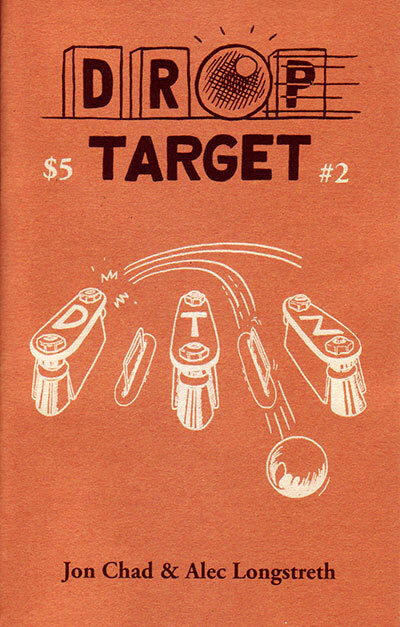 I sold some copies of Drop Target #1 and #2 and talked pinball with CFF member Drew Anderson. You can see an interview we did at the show on YouTube, in which we talk about comics and pinball and all kinds of other stuff. Saturday night I ended up at Voodoo Donuts 2, where I played Creature from the Black Lagoon, Game Show and Elvira. 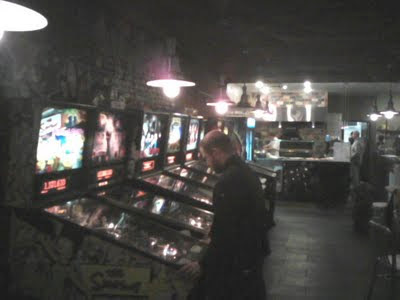 I'm telling you, every square corner of every Portland business is packed with pinball! On Sunday we met up with my old friends Gabe and Grizzo, who took us to the Good Foot bar, which had Medieval Madness AND Jurassic Park (!!?!) as well as the Data East Star Wars game. Monday we all went to Slabtown which ALSO had a Star Wars: Episode 1 machine! I couldn't help but think that maybe Drop Target #1 has helped to make this a more popular machine. Anyway, I had a blast playing it and Medieval Madness which were both in great shape. On Tuesday we made one more run to Ground Kontrol, and this time I played all kinds of machines, getting replays on T2 and Indiana Jones (Williams). Good times! Thanks Portland. I'm going to run to the post office tomorrow to figure out the shipping costs for DTZ #2 and then I will put it online (hopefully by the end of the weekend) for ordering! I have to admit its pretty cool! Things are pretty busy here at the Drop Target headquarters! Alec and I wear two hats up here in Vermont. On one hand, we're both cartoonists! Since spring is convention season for cartoonists, we've both been going all over the place. On the other hand, we're also both teachers at the Center for Cartoon Studies, and that means that it's getting close to finals, commencement, and all sorts of other end-of the-year hullaballu! So: busy, busy, busy. Not busy enough to neglect my harsh pinball regiment, though! I spent a lot of time in the Senior Studio here at the school today and CCS Senior Beth Hetland (April Fog Memorial Scholarship recipient 2011) and I played some really incredible games of Medieval Madness. There was this one really bonkers shot where the Troll came out from under the playfield and launched the ball over the dragon's shoulders and back into the shooter lane! 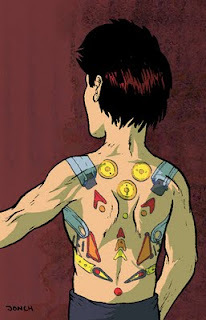 Are there any good pinball tattoos out there? Pinball and Pizza at Fratelli's! Well, Jon and I finally finished up Drop Target #2 last week! This weekend we were both in New York City selling DTZ #2 to the attendees of the MoCCA Comics Arts Festival. I had a great time at the show and found a lot of great new comics, but even better, on Friday night, I found a great new pinhall! I had a a pretty good, 115M game on Pirates, which I had never played before. We also headed over to the Satellite Lounge, which was only like five blocks away, where I had an awesome multiball on Avatar, scoring 75M (my best game on that machine yet). They also had Dracula, Earthquake, Monster Bash and the Indiana Jones, Batman and Sopranos Stern games. On Saturday night, I somehow talked my friends into revisiting BOTH establishments, where I managed to get a 98M on Addam's Family (my best yet for that one too!) and a pathetically low replay score on Monster Bash. What can I say? I was wiped out after a long day at the show. Also, a little bit drunk... Anyway, I've added Fratilli's to the sidebar of excellent Pinhalls. Definitely give it a visit if you are in New York! I will be at the Stumptown Comics Fest NEXT weekend in Portland, Oregon, and then we will finally put DTZ #2 up for online ordering. Sorry for the wait, I just won't have time to make the necessary trips to the post office until I get back. If you are in Portland, swing by the show and pick up a copy! 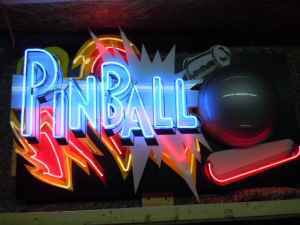 I'll report about my pinball activities in PDX when I get back! 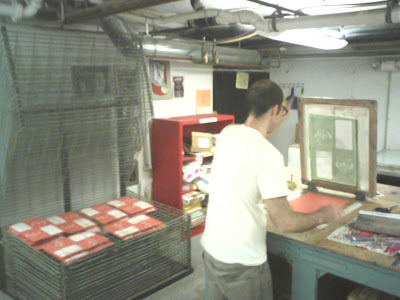 As I type this, Jon is down in the lab, screenprinting the covers for Drop Target #2! This issue is shaping up very well, and it's looking like we will definitely have it ready for MoCCA in New York on April 9th and 10th (barring any disasters!) I'll also bring a big stack of them to the Stumptown Comics festival in Portland, OR April 16th and 17th. If you are in the area, please swing by and pick up a copy! I'm dying to let everyone know what's in this issue, but I better hold off until the official release. I'll tell you this much, however - if you love pinball, you're going to love this zine!